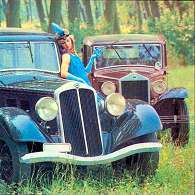 The Lancia Motor Club of N.S.W., Inc was formed in 1974 by a group of enthusiasts who had no other Club in which to participate with their cars. Fiercely independent at the time, they quickly became a group of some thirty enthusiastic owners who used their cars regularly. After Lancia pulled out of the Australia market in 1984 the Club grew quickly and since the later 1980's bas always had between 120-140 members and some 30 offspring under the age of 17 and with at least a car a member. The Club is now very much a social and friendly Club. Our monthly meetings are held at peoples homes despite the fact that we can get up to 45 members at a meeting and there is always a supper. A strong social event program sees us sing the cars at least once a month for eleven months of the year - our climate helps this objective enormously We have a bi-annual rally that circulates around New South Wales and an annual show and shine Concourse which latterly has been held in conjunction with the local Alfa Romeo and Fiat Clubs. We celebrate Vincenzo's birthday every year with a dinner at an Italian restaurant and many members see each other as friendships have formed outside of the Club environment. There is an extensive Club library on Lancia, both technical and general that is available to members, and a wealth of knowledge amongst the members on all the models. Spare parts co-operation is rampant and everyone is extremely helpful. We have a range of cars from Lambda through to Delta Integrale with Fulvia and Beta variants predominating. We have close links with the Vintage Sports Car Club and often combine events with theirs. We have a newsletter - The Lancia Fancier - eleven times a year and a Club night on the first Monday of the month except in January. 1979, Motor Racing Publications Ltd.